Being in Two Places at Once...Make that Four. Alumni Football USA hosts games in IA, IL, PA, TX- in ONE night! Happy Friday from all of us at Alumni Football USA! 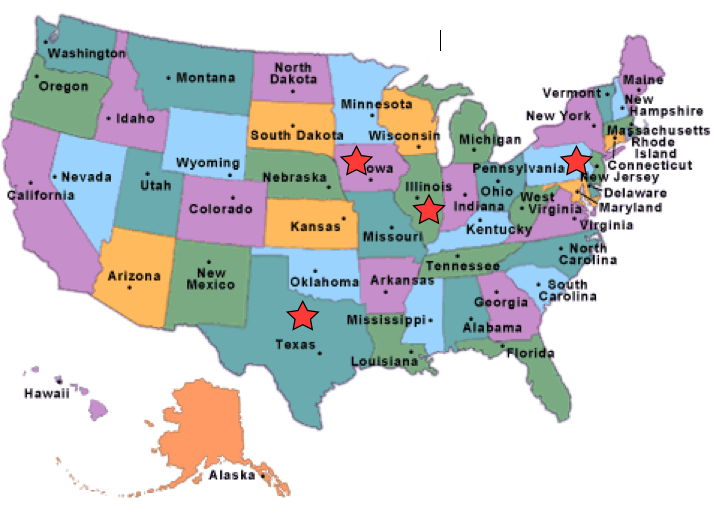 It's a busy one for us- HUGE games in Iowa, Illinois, Pennsylvania, and Texas! We LOVE giving guys all over the country the opportunity to play FULL CONTACT alumni football! And we also LOVE seeing their family, friends, and community come out to cheer them on! Here's what this weekend looks like in picture: Here's what Summer 2013 looks like: (Past Games=Red Stars, Upcoming Games=Blue Stars) You Better Get Ready. What is an Alumni Football USA game like? 74 sweaty guys, aged 19-63, and hundreds of their family members, friends and community found out on Saturday, June 8th 2013 at the Lynnville-Sully vs. Montezuma Alumni Football USA game in Sully, IA. What did they have to say for themselves? "I been waiting to do that for 20 years!" "I knew it'd be fun, but I didn't know it'd be quite THAT fun!" "It's the chance of a lifetime to have a lot of fun!" Their coach yelled at them to "Get after it!" "It's a great honor to be you guys." Did we mention that a 63 year old played in this game?! 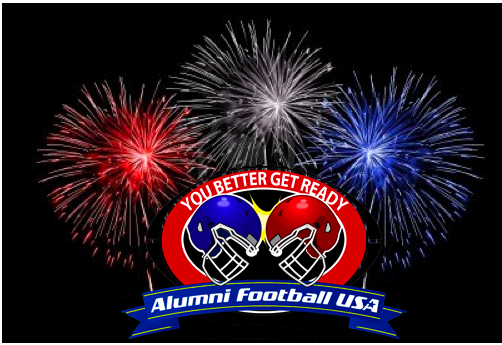 Happy Independence Day from all of us at Alumni Football USA! It's Here! The Official Alumni Football USA® App! Guess what? We now have an official Alumni Football USA® App! 1. Share. With the simple click of a button, you can tell your friends on Facebook, Twitter, Email and Text Message all about Alumni Football USA®! 2. Register. Now you can download the App and register and pay- right from your smart phone! 3. Check In. You can let everyone know you are having a blast at an Alumni Football USA® event- right in the moment! 4. Call us. 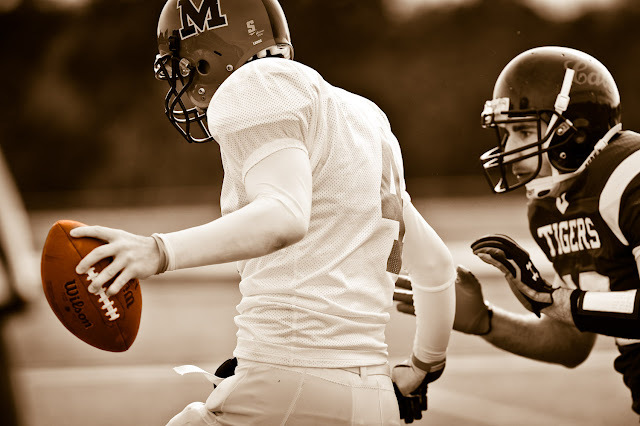 One-touch access to Alumni Football USA®- for easy registering and questions. ...and SO much more! Download it on your phone right now and explore everything this App can do for you! Alumni Football USA raises over $690,000 for schools! 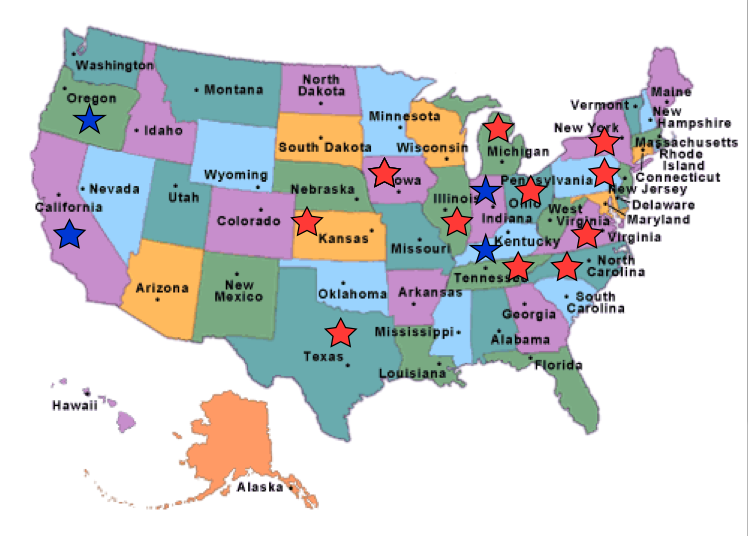 Since 2010, Alumni Football USA has helped schools raise nearly $700,000!!! While thousands of guys across America are thrilled to be living their dream of one more full-contact football game against their rival, schools are enjoying funds raised from the games. Alumni Football USA® will round up former football players from your high school, hold practices, and schedule a Full Contact Alumni Football Game! You provide the high school football field for the event. Schools sell Pre-Sale Tickets prior to game day for the event. In exchange for field use, the hosting school also gets full concession, and raffle rights at the game! tickets proceeds to the school! rights to the hosting school in exchange for the field! Bob Cazet, M.Ed., the founder and president of Alumni Football USA® , has been coaching football and softball teams since the 1980s. With a Master's Degree in education and as a former teacher in the California school system, he found that sports programs were generally the first to go in tight budget years. His love for football, teaching, and coaching led him to create a business model that benefits schools and former high school football players. Since we began recording fundraising efforts in January, 2010, schools have been praising the athletic department for the increased revenue without ANY cost to the school. But don't take our word for it, the "open book" fundraising policy at Alumni Football USA® allows you to see for yourself. Living the Pee Wee Football Dream: Cowboys Stadium! "It's like... my biggest dream...for REAL!" "This is...the ACTUAL Cowboys Stadium right here!" Needless to say, these kiddos are thrilled to be living the dream: playing football at Dallas Cowboys Stadium. Organized by Texas Alumni Football USA, the pint-sized athletes are heros as they hit the famous field to the delight of their family and friends in the stands. Some kids drove 6 hours the previous night or super early game day morning in order to be here. Some of the pint-sized cheerleaders were probably up before the sun to get their hair in ribbons and curls. The game was organized by Tim Bishop and his crew at Texas Alumni Football USA. Getting to make this happen for these little guys is awesome. We have the best job in the world, this is what we LOVE to do. Alumni Football USA® 2012. Travel theme. Powered by Blogger.